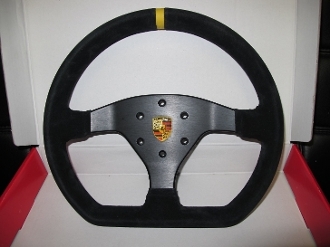 If you are looking for the 991 Cup Steering wheel, then look no further. This is the correct wheel that you need for your 991 Cup if yours is worn and needs to be refreshed. Or, if you are looking to add this great wheel to any car. The 991 cup steering wheel has the Porsche crest in Gloss. The bolt pattern on these wheels fit many different hub adapters including the Sparco Hubs that Demon Speed offers.